No. 16, Jalan Ekoperniagaan 1/29, Taman Ekopernigaaan, 81100 Johor Bahru, Johor, Malaysia. 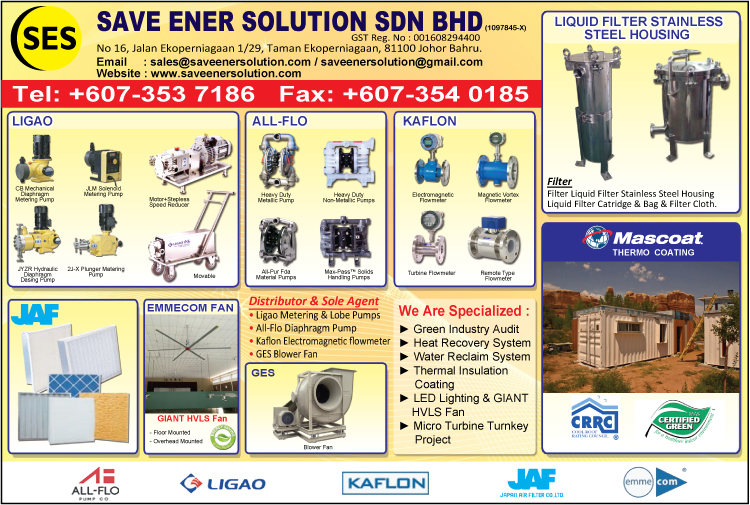 Save Ener Solution Sdn Bhd is an authorised sold distributor for Wenzhou Kaflon Measuaring and Controlling Instruments Co., Ltd and Zhejiang Ligao pump technology Co., Ltd. products in Malaysia and authorised reseller for All-Flo Pump's products in Johor Bahru. Wenzhou Kaflon Measuring and Controlling Instruments Co., Ltd. was established in 2002 which is a professional manufacturer of flometers with their R&D department. Their products include FVL-VT Vortex Flowmeters, KFL-DC Electromagnetic Flowmeters, KFL-CD Electromagnetic Vortex Flowmeters, KFL Pressure Transducers and KFL Flow Calculators. Zhejiang Ligao pump technology Co., LTD. is a professional manufacturer of high quality metering pumps with more than 10 years experience. Their main products are electromagnetic diaphragm metering pump, mechanical diaphragm metering pump, plunger metering pump, hydraulic diaphragm metering pump, rotor pump, automatic medical-adding device, whole set of dosing devices and related parts of metering pumps and so on.